The Classic Black Chef is designed and made by the hands of Joel Andersson and Adisa Copra, the couple behind Andersson Copra. 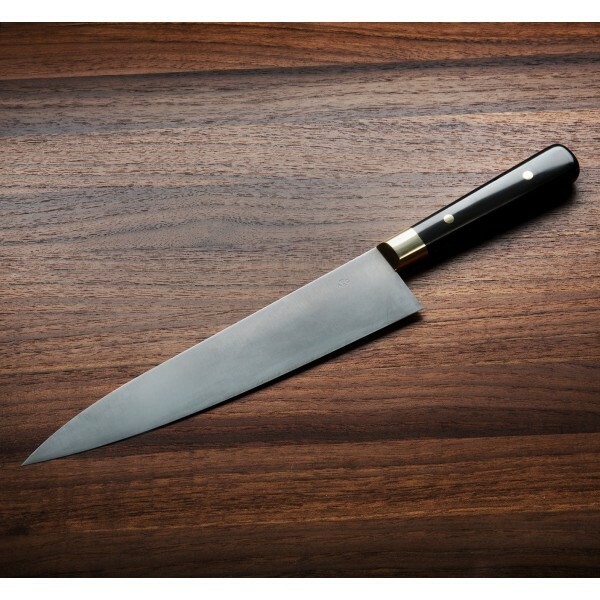 Experienced cooks will appreciate the 240mm blade with a slightly convex grind, tapering from 2.5 mm at the heel to a thin but strong tip. Swedish Uddeholm UHB-20C carbon steel, nearly identical chemically to 1095, is formed on a water-cooled grinder and individually hardened to 62 HRC. 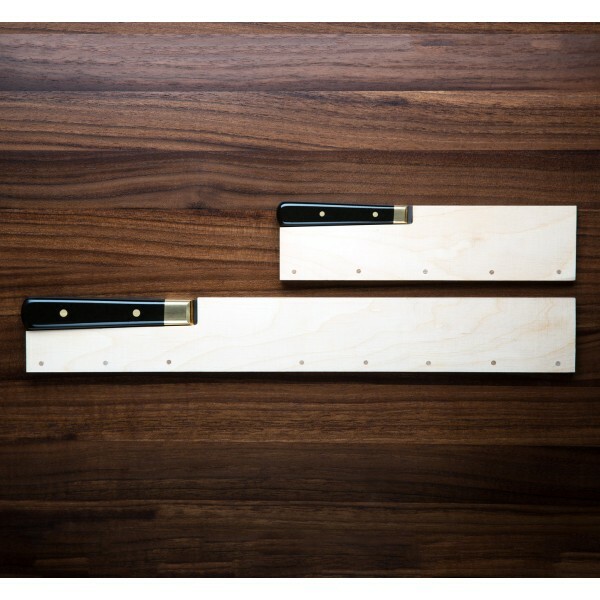 The vintage Bakelite handle and solid brass bolster will stand out while this handmade knife hangs on your knife rack and while it's at work on the cutting board. The forced patina of the blade gives a sharp and modern look that will age beautifully. 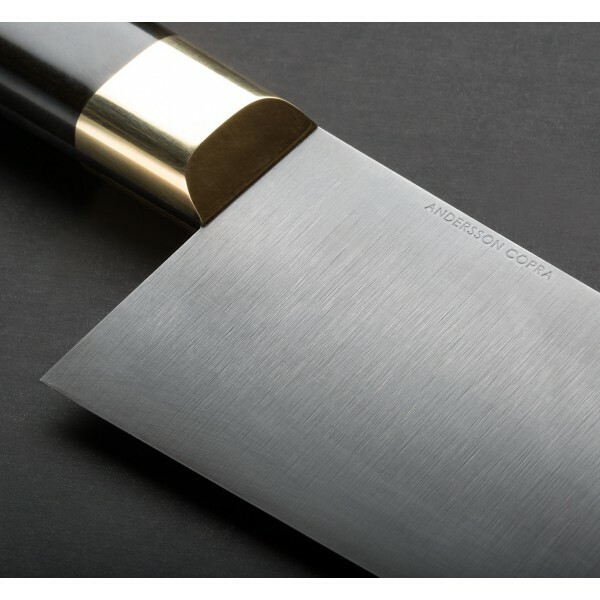 Andersson Copra’s chef’s knife in classic black is a modern reinterpretation of the French archetype and makes a beautiful set along with the Classic Black Paring. Included is the uniquely designed wooden transport case. 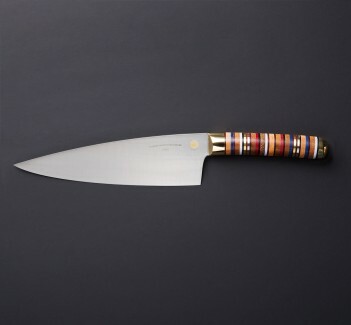 Joel Andersson and Adisa Copra make handmade kitchen knives in their small studio in Gothenburg, Sweden. 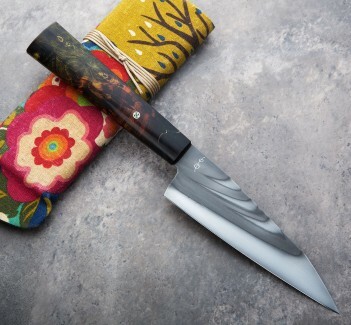 In their pursuit of the beauty of simplicity, they have fine-tuned a design and approach that result in stunning knives that are as beautiful as they are functional, making cooking easy and fun. Exhibited at the 2016 Tokyo Design Week, the Classic Black Chef is an elegant example of Joel and Adisa’s ingenuity and creativity. 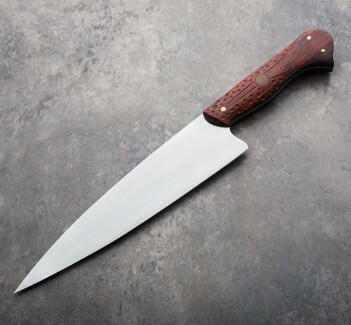 9.5" (240mm) Blade, 15" overall. Blade width at heel: 2.5mm. Blade height at heel: 50mm. Uddeholm UHB-20C carbon steel blade hardened to 62-63 HRC. Vintage Bakelite handle with solid brass bolster and pins. The quality of the andersson copra knives are beyond my expectation. I used the chef right when I got it and it cuts so beautifully. It just makes me want more of their work. There's not much out there though! 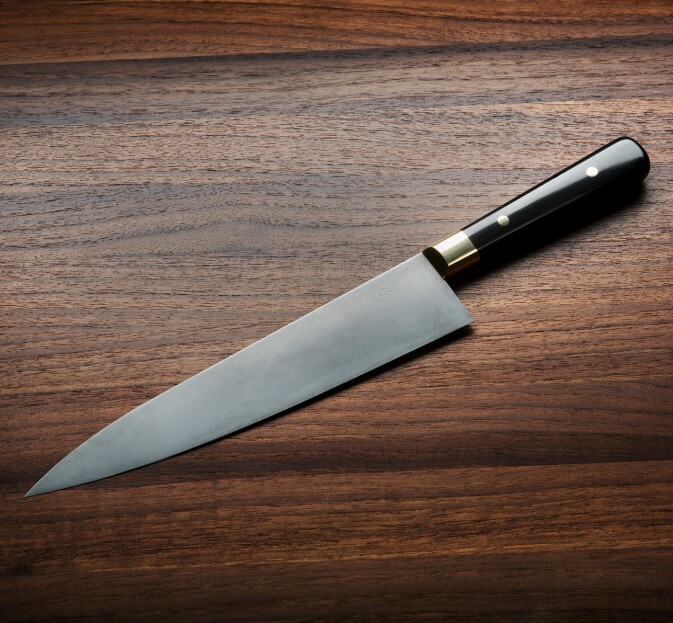 The look of the blade and the feel of the handle is perfect. Very classic.